We develop and manufacture components with different requirements for a flywheel energy accumulator on behalf of our customers. Moving parts whose function resembles that of a disc spring have to meet particularly high accuracy requirements in terms of concentricity and fitting dimensions. Therefore, these components are manufactured in a calibrated and tempered steel tool to final dimensions and do not require any further processing after hardening. We manufacture parts of the safety housing surrounding the rotor with phenolic resin matrix in the RTM process in order to meet the high requirements regarding temperature resistance and fire behaviour. Tools made of polymer concrete with epoxy resin matrix and surface have proven to be suitable for this purpose. These components are also manufactured to final dimensions and do not require any further processing. 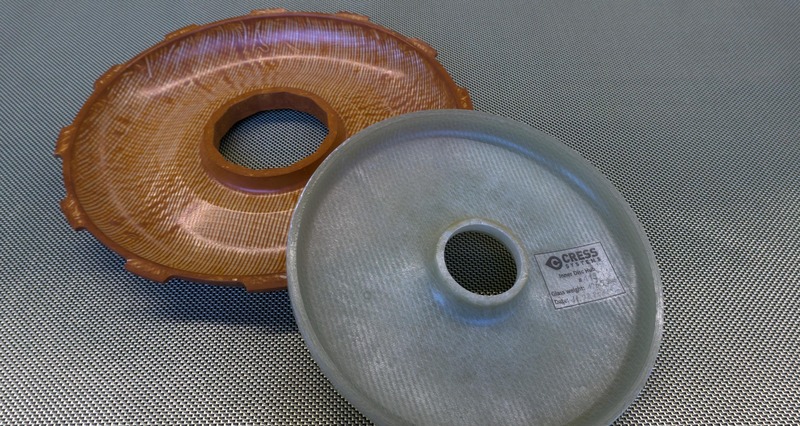 This also applies to the components of the vacuum housing, where the main focus is on the lowest possible air content in the laminate in order to minimize possible vacuum losses in advance. An air content < 0.1 % can be ensured by a special process control and particularly tightly closing moulds made of polymer concrete.